These are a series of audio calculators that sound system designers, engineers, and technicians frequently need to access, such as determining amplifier power requirements, converting between dBu and dBV or volts, or estimating the loss in sound pressure level with an increase in distance. All of the easy-to-use calculation tools are accessible right here by clicking on any of them above. Extron XTRA Series amplifiers are highly efficient Class D amplifiers that draw less power than conventional amplifiers. As ENERGY STAR qualified amplifiers, they also automatically enter a very low power "sleep" mode after 25 minutes in which no signal is present at the input. System designers frequently want to know the energy usage of a rack of amplifiers, as well as how much cooling will be required. Since amplifiers generate significant waste heat, this is a key factor. This audio tool calculates the total input power draw, thermal dissipation or waste heat, and the required cooling for a collection of amplifiers. Up to four types of Extron XTRA™ series of amplifiers can be selected. Select the line voltage for the region in which the amplifier will be used, select the type and quantity of amplifiers, select the desired speaker impedance for amplifiers with low impedance outputs, and then press Calculate. Power Draw and Thermal Dissipation figures at 1/8th power output are taken from the XTRA Series amplifier product specifications found at www.extron.com. Cooling Required follows the industry practice of measuring air conditioning cooling capacity in tons. The required capacity is calculated by dividing the BTU/hr heat load by 12,000. Annual Calculation assumes amplifiers are operating for 2,080 hours at 1/8th power, and 6,680 hours in standby mode. For more information, see the white paper at www.extron.com/xtrapaper. Please see the XTRA Series User Guide for proper amplifier spacing requirements. Sound system designers frequently want to know much amplifier power will be needed to deliver adequate sound pressure levels for the application. This can be determined based on the desired listener distance from the speaker, the desired sound pressure level of the audio at this distance, and the loudspeaker's published sensitivity rating to provide the reference acoustical output at 1 watt at 1 meter. For Extron speakers, use the dropdown box and select the desired Extron speaker to automatically load its sensitivity into the calculator field. Additional headroom should be added for the amplifier, for example, 10 dB, to account for variability in program audio levels. This audio tool calculates the acoustical attenuation from the reference location of 1 meter (3.28 feet) to the listener, and then applies this, together with the sensitivity rating and amplifier headroom, to determine the necessary output power from the amplifier. Volts, dBV, and dBu are three units describing voltage levels that are used interchangeably in professional audio based on the point of reference. This audio tools provides a quick and convenient means to convert between them. dBV refers to a voltage magnitude referenced to 1 volt, while dBu is referenced to 0.775 volts. 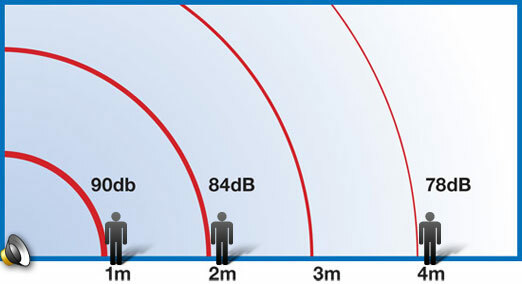 Sound pressure level - SPL decreases 6.02 dB as a listener's distance doubles from the sound source. This number is commonly rounded down to 6 dB. The opposite is true as the listener halves the distance to the source, so that the SPL decreases or increases by 6 dB with every distance doubling or halving, respectively. The Inverse Square Law is used to calculate the change in SPL with distance, and is useful in predicting the sound pressure level a listener will experience as speaker placement and sound levels are considered. Ohm's Law describes the relationships that exist between voltage, current, and resistance. Quantities of these properties are expressed in volts (V); amperes, "amps" (A); and ohms (Ω) respectively. The product of voltage and current is the applied power and is expressed in watts (W). A change in power, from P1 to P2 can be expressed as a ratio in decibels with the equation dB = 10*log(P2/ P1) . A doubling in the power level translates to a power ratio of 3 dB. Similarly, halving the power equals a -3 dB power ratio. A change in voltage, from V1 to V2 can be expressed as a ratio in decibels with the equation RV = 20*log(V2/ V1). A doubling in the voltage level translates to a power ratio of 6 dB. Similarly, halving the power equals a -6 dB voltage ratio. This calculator can also be used to express differences between two distances or pressures. Sound system designers and sales engineers need to know how many ceiling speakers are required for proper coverage in a given application. Each environment is different based on the room dimensions and ambient noise. Consideration must be given to the listener height, audio program content, desired SPL - sound pressure level, and how much the client will tolerate sound pressure level variances throughout the space. Since speakers are often tailored for specific applications, their design and performance play a major role in determining quantities and positioning. This audio tool utilizes a database of speaker coverage angle values for Extron ceiling speakers, based on the type of audio content and amount of SPL attenuation. Speaker performance data for traditional polar plots were normalized and then linearized onto a horizontal plane to calculate sound pressure levels for standing or seated listeners. This tool also provides power recommendations and transformer tap settings based on speaker sensitivity data and desired SPLs. PendantConnect™ speaker cable is an Extron exclusive hybrid design incorporating the speaker wires and steel support cable into a single outer jacket, allowing the integrator to achieve an absolute vertical hang with only a single visible cable. PCC-1 cable is used exclusively for the SF 3PT SoundField Pendant Speaker while PCC-2 cable is used exclusively for the SF 26PT SoundField Pendant Speaker. This audio tool calculates cut, strip, and reference mark points for PendantConnect speaker cable based on ceiling height and desired speaker height. The calculator on this page is used when pre-cutting cable prior to cable termination. The simplified formula below may be used when the PendantConnect speaker cable has already been terminated at the speaker end. Room Height - Bottom of Speaker Height = Cut point on cable, measured from the top of the speaker cap. Then strip six inches down from the cut point.